Have you heard of BuildBox yet? Let’s talk about it! Buildbox is a game development platform. 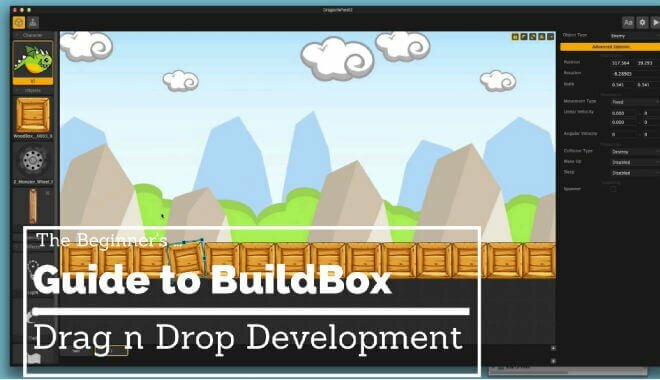 Unlike some traditional game development platforms, there’s no code involved with BuildBox. As the name suggests, you just drag and drop to build games. Nice and easy. Since it’s release in January of 2015, over 40 games built by BuildBox have been featured on Apple’s Featured page. More top 100 hits have been built with BuildBox in the past 1.5+ years than the other game builders combined. Based on their metrics, it certainly seems like they succeeded. One of the biggest barriers to building a game has always been learning the coding and programming skills. What the Drag N’ Drop Buildbox does so effectively is take all the coding and programming requirements out of game design. The development platform hides all the coding and programming behind the scenes, which makes for an intuitive, easy-to-use, any- person’s development platform. Every tool you need to build the game you want to make is included in the BuildBox. Can You Actually Make Anything Cool With It? It’s easy enough to get started, too. You can start building a game right now for free, just by entering your email address. The team at BuildBox compares using their drag and drop game builder to making a PowerPoint presentation. Making a PowerPoint is a piece of cake, can designing a game really be that easy? Let’s take a look at the capabilities of BuildBox. How does it actually work? Adding a new character? Drag the image into the level editor. Need a new enemy? Drag and drop. Looking to add objects, platforms decorations, powerups, effects, or backgrounds? All are draggable and droppable. That’s all it takes. It is, for the most part, all drag n’ drop. When it comes to the properties of the elements you’re dragging and dropping, you can edit them by selecting them. It is an intuitive interface, even beyond its dragging and dropping simplicity. BuildBox will open the door to many game creatives that never cared to learn how to code. At any time you can hit “play” and you’re immediately transported into the game. The play mode renders itself instantly, so you can immediately get a feel for what you’ve created so far. The “creator tool” assembles a skeleton of your desired game. It functions as a quick-start feature. You pick the game type that you want to design around from a list of full-world gameplay presets. You can pick anything from a runner game to a dogfight game, and BuildBox applies the appropriate presets to the world you’re creating. This affects everything from the physics properties to the character settings. The “scene” editor (“scene” is used synonymously with “level”) lets you quickly expand from the loose framework BuildBox provides in the beginning. The starting placeholder graphics are very simple, and based on the gameplay type that you chose. It starts with a single enemy, a character, a platform, and they round it out with a single particle effect. You can easily edit these to your liking, then copy them to add more, or change things to flesh out the scene however you see fit. Buildbox lets you create more than one world in your game using the World Settings feature. This lets you do a number of things. When a player reaches the end of the world you can choose to automatically send them to the next world. Think Super Mario Brothers. Or, you could send the player to a level select screen like Super Mario Brothers if you took advantage of the level-warp pipe. Or, you could make your world endless. If players were good enough, they could keep going indefinitely. BuildBox lets you add effects and animations to different characters. You can adjust how they move, how they shoot, how they jump, and how they interact with the world. You can adjust the sounds for each character action, too. As of BuildBox 2.0, you now have multiple character support. This means you can have separate sounds, separate special abilities, and different powers and functions for multiple characters in your game. With multiple character support comes unlockable parameters. That’s right, you can set parameters for unlocking different characters in your game. In-game currency or level completion are two popular options for unlocking characters. Those looking to make more complex games might enjoy hearing about the auto-depth sorting feature that BuildBox contains. It serves its titular function; it automatically sorts out any possible depth issues that arise during complex game creation. We don’t know why you haven’t started messing around with it yet, we’re finished writing about it and it’s free right now… See you on the featured games page!